Everything They* Ever Told Me Was a Lie: Pat Shannan has long been one of America’s premier investigators. Now he turns his eyes on things that bedevil us all and unravels the mysteries. 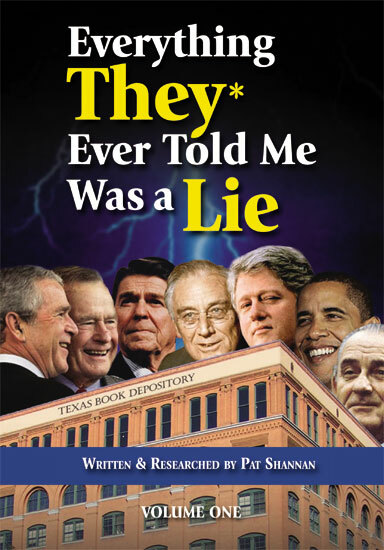 Incredible new insights and previously unknown secrets about Ronald Reagan, Abe Lincoln, Franklin Roosevelt, Tim McVeigh and Oklahoma City, James Earl Ray and the murder of Martin Luther King, Jr., the two Oswalds and the JFK assassination, the shooting of George Wallace, the assassination of Robert Kennedy, the murder of Pat Tillman, the Moon Landing hoax, and 9/11—an inside job. A Terrific Book!—Highly Recommended!